When about a year ago President Dmitry Medvedev suddenly began to characterize North Caucasus terrorism as one of Russia’s main problems, one that still remained to be solved, it almost seemed like an anti-Putin rebellion. For many years, Medvedev's predecessor had claimed credit for the pacification of Chechnya and tried to convince Russian public opinion that by the use of strong-arm tactics he had been able to avert a mortal threat to Russia's entire future. Medvedev’s statements seemed to contradict Putin's rhetoric, and so they sounded almost revolutionary. 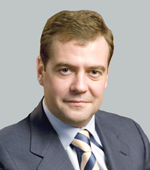 It gradually became clear that for Medvedev the North Caucasus was a subject of special concern. This prompted him to create a new North Caucasus District, and he established the post of special envoy at a ministerial level. The appointee to the post, ex-Krasnoyarsk governor Alexander Khloponin, has allegedly received extensive powers. All of this looks like a serious bid by Medvedev to provide his own resolution of the North Caucasus situation, either in rivalry with Putin or in direct opposition to him. Last week some Russian analysts drew attention to an address Medvedev delivered at an unveiling ceremony for the new building of the Kabardino-Balkarian branch of the FSB in Nalchik on February 27. Although the speech devoted only a few lines to the armed insurgency, it gave us some idea of his approach to the problem. In the address, extremism is called a “cancer”, a deadly disease for which no cure has yet been discovered. Since the disease appears to have swept the entire region, the prospects for the future do not look particularly bright. No one can accuse Vladimir Putin of making empty threats. His promise to “flush the extremists down the toilet” has been fulfilled a hundred times, if not more. But if his recent words are anything to go by, the new President appears less certain of a positive outcome.